The bottom is part sand, part flat rocks. Depending on how big the waves are, it can be ok for swimming and wading. There are not many bars and restaurants directly on the beach, but there is a moveable bar and a couple food vendors and someone renting lounge chairs and surf boards and boogie boards. You can walk to Berawa from other beaches or reach the beach on Jalan Pantai Berawa or Jalan Batu Belig. If you walk a hundred yards or so from the road in either direction you can have a pretty big stretch of beach to yourself most days. 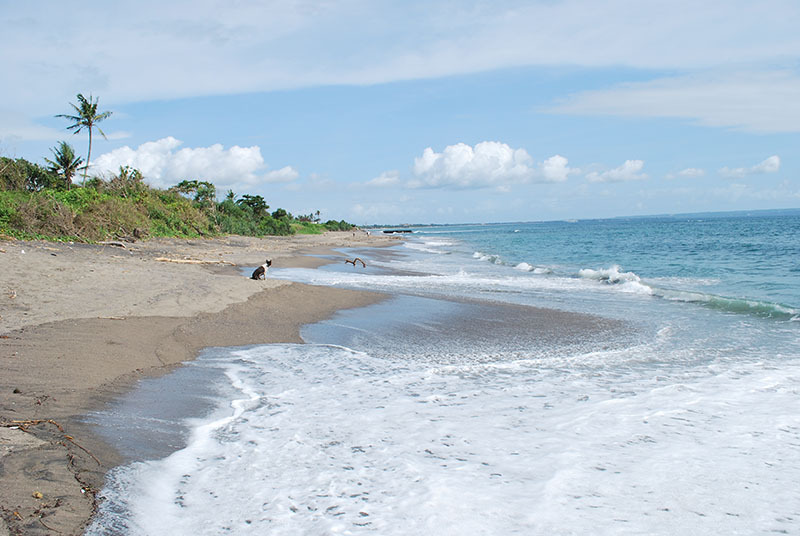 Nelayan beach has almost no development and still has a small active fishing fleet. There are rarely waves here and less current than on the other beaches, so Nelayan is the best beach in Canggu for wading and swimming. Batu Bolong has a big parking lot with several good, cheap warungs (local style restaurants) serving a mix of Indonesian and western food. There is a big temple on the south end of the beach. The best secret in Batu Bolong is the temple behind the warungs. It is small, but filled with intricate details. You cannot enter, but you can see plenty walking around the outside. Echo Beach is the worst beach in Canggu for swimming or wading. It has heavy surf, reef bottom, and a breakwater. Atop the breakwater there are several popular restaurants offering a great view of the expert surfers charging the reef break near the shore. This is the most upscale beach in Canggu and a great choice for sunset drinks or dinner. Pererenan beach on the other side of a small river which you can cross 100 meters inland on a small bridge. Pererenan beach has heavy surf and some current and rocks on the bottom in places, so it is not a great choice for swimming and wading. There are some warungs in front of the surf breaks where you can grab a beer and a snack. If you walk to the northwest you can find an empty stretch of beach.